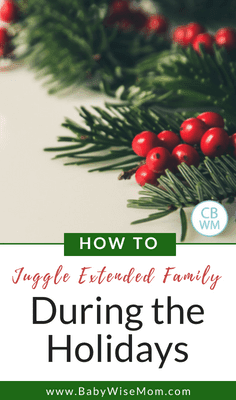 How To Juggle Extended Family During Holidays. Tips to help you balance time with all sides of extended family and still have time for your little family. My husband and I were engaged over what is known as “the holidays.” We had a short 7 week engagement that went from November 14 until January 2. We were also both full time college students, so we were engaged over finals week. Needless to say, it was a stressful time to try to cram in wedding plans. As if dealing with planning a wedding, studying for finals, finding a place to live once we were married, and dealing with normal “holiday” hullabaloo wasn’t enough to deal with, we also found ourselves faced with trying to figure out how to split up holiday time. Both of our families had events with both of their families, so we had four extended family events to work in along with my husband’s immediate family (my family just did stuff with extended). To make things harder, the families were in two different states (in the West), so it wasn’t as though we could easily hop from one place to another. So we had five families to work around and squeeze in and in two different states. Frankly put, it was a nightmare. The next holiday season came along and really wasn’t any better. We still hadn’t decided what we should do during the holidays and really aimed to please everyone. Some were easier to deal with than others. I was pregnant with Brayden, extremely sick, and we were back to state-hopping in an effort to please everyone. The next holiday season was Brayden’s first holiday season. For the first several months of Brayden’s life, we were still living in “try-to-please-everyone” mode and the three of us were miserable because of it. In October, I finally declared enough was enough. We needed to step up and do what was best for Brayden and let adults, essentially, grow up and get over themselves. I really think grown-ups can think about what is best for children and work with that. Not to say children should never be disrupted at all–sometimes that is okay. But adults can give, too. And I actually think adults should be more flexible than children. My husband and I found ourselves absolutely dreading the approaching holiday season. The last two years had not been enjoyable for us in the least. I hated dreading that time of year. It had previously been my favorite time of year, and religiously an important time of year. We decided we needed to set some boundaries and lay down expectations. Here are some frank tips for helping you to set your own boundaries. Some people just will not be please with anything less than 110% of you. Unless you plan to abandon all other family members, that isn’t going to happen! You can’t take to people and give the same amount of time to each family over the holidays (unless one of you has no family). You have to visit both families. And there are frankly some people who will never feel satisfied with that. Even if they get it on a logical level, they will be hurt on an emotional level and will never be pleased or satisfied with what you can give. Take note of these people and STOP trying to please them. Because they won’t be! They will always have something to complain about that you aren’t doing quite right. Some will let you know outright and some will let it fester for years before blowing up about it. As you go through your next steps of figuring out how to juggle this, do not worry about pleasing those who will not be pleased. Think through what your different options are for juggling family around the holidays. Talk to other people to find out how they do it. Write ideas out. Write out what parties and events traditionally happen when and think about ways you can do as much of the things that you would like to do. Think about where you would like to be when. There are some common ways people work around this conundrum. Some people establish a certain day for certain parties every year. For example, my dad’s family does a Christmas party the first Saturday after Christmas each year. We were with my mom’s family on Christmas and my Dad’s the Saturday after Christmas. My mother-in-law’s family used to do a family party on Christmas Eve each year. Some people take an alternating approach. One year, they are with the wife’s family on Christmas Day. The next year, they are with the husband’s family on Christmas Day. Some people stay at home on Christmas Day and visit extended family on other days around Christmas. Some people have families that live close enough that they squeeze both families into the same day. Now that you have your lists of options, think about what is best for your family. What will work best for the two of you and your children? Every year, my parents packed up Christmas and drove it four hours so they could be with their parents at Christmas time. I have found very few people are actually interested in doing such things. My husband and I tried that out initially and found we didn’t like it! Think about your different options and decide what seems will be best suited for your family. Once you have decided what your plan is for dealing with the holidays (and isn’t it sad that I even have to put it that way? “Dealing” with the holidays? I guess more like dealing with family at the holidays), very clearly tell your family of your plans. Don’t sweeten it up or beat around the bush. Just say, “We will do XYZ from now on.” End of story. Don’t leave things open to interpretation. Don’t expect this to go any better than it would go to suddenly tell a 13 year old she will now have chores ever day when she previously has not. If you are in a situation where you feel you have to take these detailed steps, you will have family members who take the new plan very negatively. Some will take it as a sign you hate them and never want to see them again. Some will cry. Some will take the passive-aggressive approach and act okay with it initially but then push you on it when the time comes to put your plan in action. Hopefully you are like us and will at least have some family who says, “Great! We are great with whatever you can do.” And NOTE to all of us–let’s all be that way when our own kids get married! Deal? As you are faced with the range of emotions of the new plan, stand your ground. Go ahead and assure that you still love them. Turn down offers to come to things that you have already clearly stated you will not be able to attend. Some years, you will be able to change things up at times. When you do, make it clear that you are making a one-time change. Open communication is the best way to make it through these situations. I was sorely disappointed when I got married and learned open communication was not always the easy answer. As a English Major and Communications Minor, I had been taught that if you communicate openly, conflict is easily resolved. This is unfortunately not always the case. Sometimes it takes years or decades of open communication. Sometimes all open communication gets you is clear understanding of what you will and will not do. It definitely doesn’t always get you a Kumbaya moment. Curious what our end-plan was? We were lucky enough that my husband’s little sister got married the summer Brayden was a baby and they were smart enough to seek out a plan right away. They were interested in an “every other year” plan so we went with that. Thanksgiving Day: With my family. Another day around Thanksgiving: Do a party with my husband’s family. The day is not set–we just find one that works for everyone. Christmas Day: With my husband’s family. We wake up at home, open presents, then go to my in-law’s house. Another day around Christmas: Do a party with my family. There is no set day–we just find a day that works for everyone. Thanksgiving Day: With my husband’s family. Another day around Thanksgiving: Do a party with my family. The day is not set–we just find one that works for everyone. Christmas Eve: We host a Christmas breakfast at our house. Everyone from both sides of our families are invited. Christmas Day: With my family. We wake up at home, open presents, then go to my parent’s house. Another day around Christmas: Do a party with my husband’s family. There is no set day–we just find a day that works for everyone. I am always interested in hearing how people have worked this out. What do you do to juggle family around the holidays? We are fortunate to live in the same town as both families. This is our plan:Thanksgiving = early afternoon meal with husband's family and friends; early evening meal with my family at my parents house. The homes are about 10 minutes apart!Christmas = last year, Charlotte was 3.5 months and still on three naps. She did nap #1 at home, then we went to my parents house for gifts and nap #2, then to my in-laws for gifts and nap #3. Our homes are about 3 minutes apart. This year, with two naps, we'll go to my parents pretty early and do gifts for her, then our gifts while she naps (10-12). Then we'll go to my in-laws for gifts and take Charlotte home for the PM nap. We'll do more family activities (maybe at our house!) in the evening. If she's down to one nap, she'll take that at my parents house before going to the in-laws in the late afternoon. Easy! Our families live within 10 minutes of each other so for the first few years of our marriage we were able to be with both. We moved out of state and now have a child and last Christmas was horrible We drove back and forth six times on Christmas Day so both sides could see gifts being open and both sides could have dinner together. We have decided to stay home and only visit family every three or four years. They can come to is of they like. It is sad not having lots of family around something that both me and my husband were used too but this is what works best for our family. Yeah, I agree that grown ups should just grow up and get over it. Telling my family(parents divorced, so my dad's side) that we decided to just do Christmas day at home was like the end of the world. I got fussed at; I got the guilt trip argument; I got flat out anger! Last year, my family wouldn't even let me come over on a different evening to exchange gifts. They were always too busy with "family functions"(I kid you not, that is how it was relayed to me…what am I? chopped liver???) to arrange time for me to come over. It is their way or the highway. Hello, highway. On a nicer note, my in-laws and mom are just happy to get together whenever. But I too hate how the holidays bring that stress of having to "deal with the family about the holidays." I can't seem to get past it. Someone would have always have to give though. We can't do our house, my mom's, my dad's and my in-laws all on Christmas day. How can that be enjoyable for anyone? My family (including MANY extended family members) lives in the same town as us and my husband's family lives about three hours away. Our first year of marriage, we tried to please everyone and it was brutal! So, last year we settled on this plan… my husband is working towards his PhD so we will most likely be moving in a few years and things will change. But for now, it goes like this:Thanksgiving: In-Laws' Holiday; We go either the day of or day before and stay through Saturday. We go Black Friday shopping and watch the Iron Bowl! We may try to stay until Sunday since this is our daughter's first Thanksgiving. The in-laws would like it. My parents are always invited to my in-law's for Thanksgiving but they have either spent it with my siblings or with extended family. Christmas Eve: We spend some time with my parents. Last year they came over and we played gift card Uno exchange! Christmas night/morning: Stay at our house.Christmas day: PJ Breakfast at my aunt's (WAY fun), then home to play with presents/nap, then a movie with my parents/siblings1 or 2 days after Christmas: To the in-laws we go! We usually stay 3-4 days. I am thankful that our families have agreed to this "schedule". I am adamant about being at home on Christmas day not so much because I want to just be at home, but because my extended family has SO much fun at Christmas breakfast and since we will most likely have to move in the near future, I know we eventually will only be able to go every other year. My in-laws understand because they don't have much extended family so it's not as hard to arrange family get-to-gethers. We live in Virginia & our families live in NJ/PA. Our first year of marriage, we tried to visit everyone & ended up exhausted, which was especially hard because we're both teachers & neither of us felt rested after the much-needed Christmas break. We decided to make a change for the following year, which we have followed every year since- Thanksgiving with one family & Christmas with the other (not necessary Christmas day, but some part of the holiday week). It has worked SO well!!! We told the families in the spring for the following holidays so there was plenty of time to have it sink in. We only deviated one year when we did Christmas 2 years in a row with my family because my sister got married right after Christmas that second year. His family understood though. Since then, my parents have moved to AZ, so driving to visit isn't an option anymore. We still follow the plan though, although sometimes for the "together holiday", my parents and/or siblings fly here to visit or we fly there. We kind of change up where the holiday gathering is depending on who can make it that year for that holiday. We almost always decide to stay home for the actual Christmas Eve & Christmas day. Usually if we're the ones traveling, we'll head out very early on the 26th to visit family so that have enjoyed a restful & fun just-our-family in our home together.Making that decision & communicating it was hard, but it was so worth it. The past 8 years we have enjoyed the holidays much more, and this year will be no exception. A clear plan & communication really helps! I'm really dreading December this year. My mom and my husband haven't been on speaking terms since or daughter's birth (December 1) so they will not be together for anything. I'm an only child with only my mom and grandma in our city. My dad is 4 hours away and the in laws are also divorced, and live an hour from each other 7 hours away. Really everyone is understanding but my mom. We decided before kids that we'd do the every other also, except we do one here, one there, and one at home alone. My dad takes the backseat and just sees us "around"the holidays. This year we also factor in a first birthday party for our navy who's the first grandchild on both sides, with a maternal grandma who won't be invited. Should be fun! Its an amazing moments when we are with family.We have a good journey when we are with family.I love it and thanks for sharing. Allison that is so nice you are able to be with both families in the day! Thanks everyone for sharing how you work things out! Stephanie it is true–it wouldn't be enjoyable. Not even all of those people would enjoy it because you wouldn't be able to stay for long. Either that or the last one on the list for the day would end up getting left off because you ran out of time. so true about communication Danielle! Oh Sarah that sounds so rough! I am so sorry!